(Hypebot) – While still hugely popular, YouTube is facing pressure on many fronts. Key to Google's response is the launch of a long-rumored paid service, as well as, an ongoing squeeze of the creators that made YouTube popular. Yesterday, Google's YouTube sent a letter to its top creators signaling the eminent launch of ad free paid subscriptions. Rumored to be priced at $10 per month, YouTube will let creators place videos behind a paywall, so that only paid subscribers view them, sources tell The Verge. Lower priced subscriptions for specific categories like music are also possible. YouTube's music and video subscription service Music Key remains in beta with a $7.99 monthly charge. 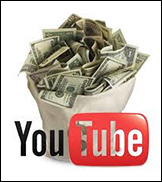 YouTube will pay you 55% of the total net revenues recognized by YouTube from subscription fees that are attributable to the monthly views or watchtime of your Content as a percentage of the monthly views or watchtime of all or a subset of participating content in the relevant subscription offering. In the letter to creators (full text here) and the new terms of service, YouTube informed creators that not signing the new agreement would result in their videos being labeled as private. No deadline to sign was given… yet.